I have some NASA books on space colonies and space mining from the 70's that have fantastic paintings in them. These would be great page filler for a BR (or Alien) magazine. I can scan them to share with the group at some point. Anybody up for writing some articles or page filler? As we approach the New Year and draw closer to our return to that enchanted world of Sir Ridley and PKD, we can but dream of sugar plums and fairy tales, androids and killer replicants. Ah, the Holidays! . . . . A little something for your stockings! Best to all who venture forth this season. Be careful what you wish for . . . .
Posted: Fri Dec 16, 2016 2:39 am Post subject: ZORDORIFIC! Thanks for sharing this Bendzhamin! Although it may not be available as a collectible, it is nice to view the entire piece. Very well thought out and executed. The second was equally inspired and would fit well into the universe. TFS Ben. I love that kind of book/mag with great pics and ideas; in this case of déjà-vu it really fits well into the BR universe. 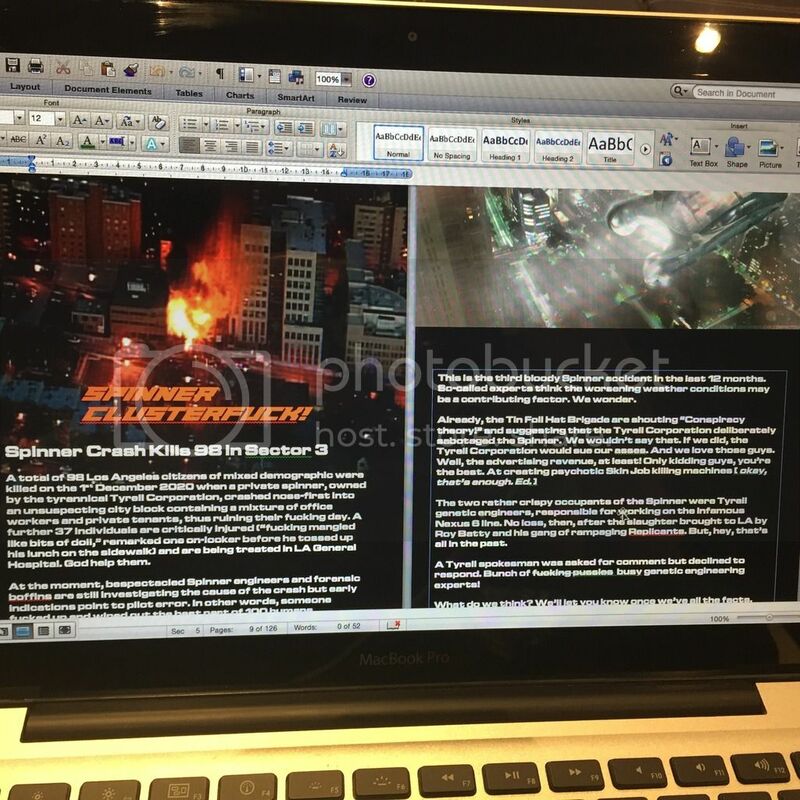 I've nearly finished the content for my next couple of BR mags. Here's a sneak peak at Kill! Coming from you, that's the ultimate compliment! Sincere thanks, sir! 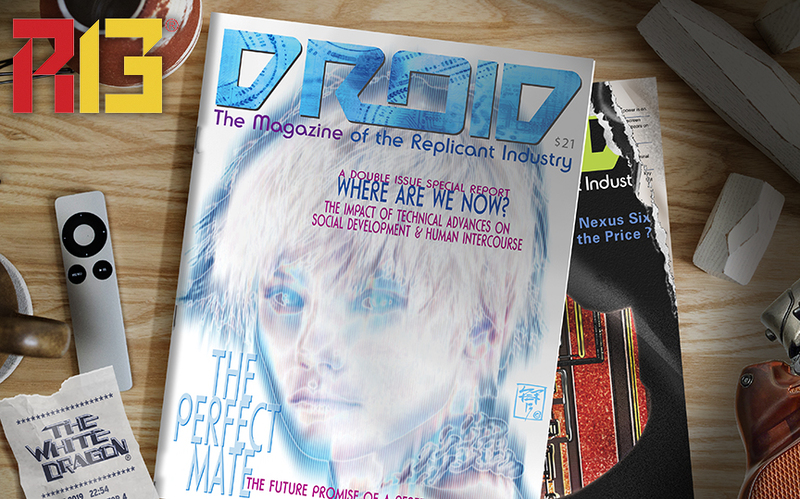 Yep, hundreds of hours have been spent on the magazine project so far and I feel I've only scratched the surface. It's great fun but there's a lot of work left to do before I visit the printers again. 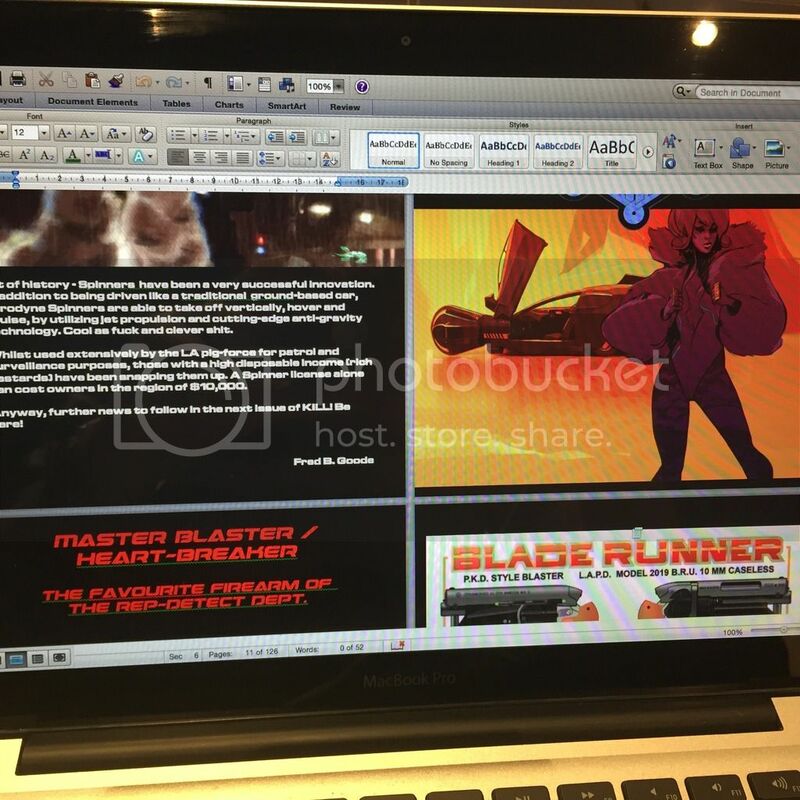 While this has been a fun ride, and I will always be a fan of the original (it remains to be seen how "2049" will influence us), with the advances in tech since 1982, I doubt the printed form will play a very significant role, if any, in the new film - effectively putting such recreations as printed magazines and badges on the endangered species list, along with PKD's horses and sheep. Perhaps there will be other areas to focus upon . . .
Well, some are saying that the print form is dead and gone...not so according to stats (but that's another topic of conversation altogether). 2049; what kind of tech do they have to spread news and such? As you said Dave, we'll see. Many here may know, but many may not - or weren't even around in 1978 when Penthouse Publishing launched it's new science magazine. OMNI found its audience and remained in print until 1995, and online for a short time thereafter, but its significance to this universe has remained. 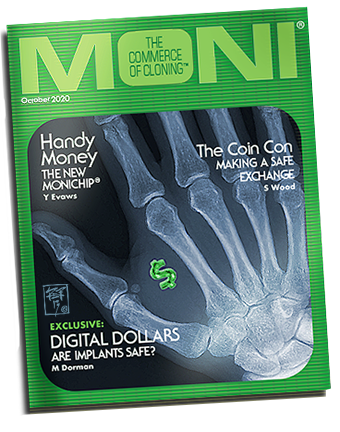 Now, in a world where magazines are dissappearing, with the impact of the internet and the Millennial $$$, OMNI is back! Ah, such sweet torture. You need to sell these beautiful pics! Thank you so much for posting this Replicant 13. Omni magazine was one of my favorite magazines, I still have articles I saved from it and even have my favorite issue stored away in a plastic bag. I never thought it would be in print again - great mix of science and science fiction. You're quite welcome, LxB. In an age where digital is making the tangible obsolete, I still prefer something I can hold and savor. A well-crafted miniature, a book, a pencil, a face-to-face conversation. These should not be discounted. Some day the next generation may see the value of embracing reality. Just existing, as a monthly publication OMNI bridged both worlds, IMO.